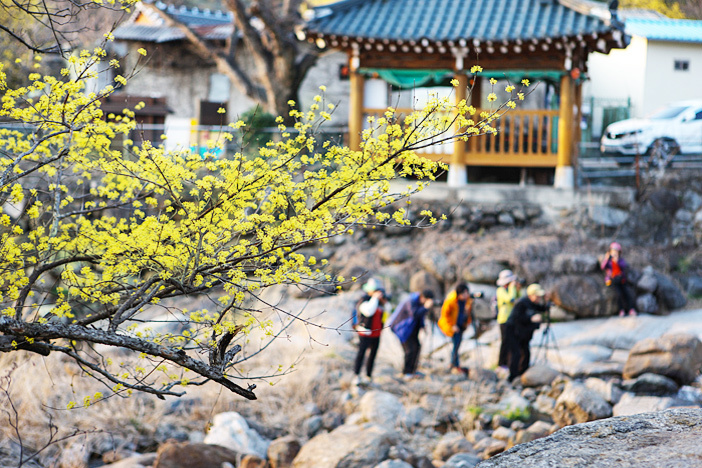 Every year in mid-March, the Sandong-myeon area in Gurye, Jeollanam-do takes on yellow hues from the sansuyu (cornus fruit) flowers surrounding the area. Seen from afar, sansuyu can easily be mistaken for forsythia. Up close, however, it is a very small flower with petals only about 2 millimeters long. The flower is not that fancy on its own, but when seen by the thousands, they become a sight to behold. Read on to learn more about Gurye Sansuyu Festival, which heralds the arrival of spring. 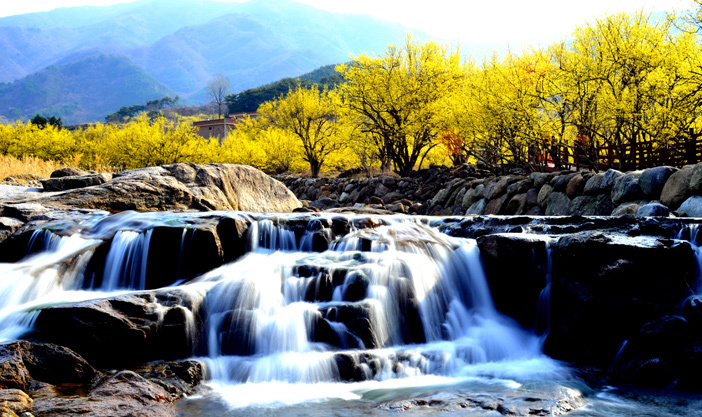 The theme of Gurye Sansuyu Festival's 18th anniversary is "Finding Everlasting Love," and the festival is held March 18-26 in the hot springs district of Jirisan Mountain in Gurye. Gurye has long been famous for sansuyu, after a maiden from Shan Dong, China planted a single sansuyu tree that she brought with her from China upon arriving at her marital home. The small villages that make up the venues of Gurye Sansuyu Festival each offer a uniquely different landscape, but none can compare with Sangwi Village. This village features approximately 30,000 sansuyu trees that turn the village into a spectacular field of yellow in March. The entire village makes for a good photo spot, drawing flocks of tourists to the village every year. 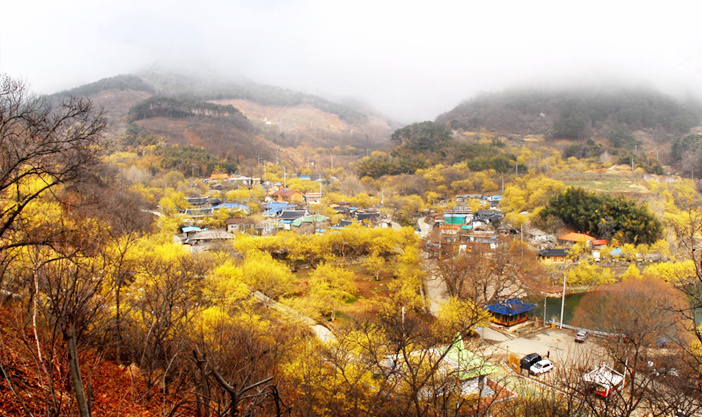 To enjoy the festival at a slower pace, visitors are recommended to visit Hyeoncheon Village in Wonchon-ri. Unlike Sangwi village, which bustles with visitors during the sansuyu season, Hyeoncheon is less frequented, offering a quieter ambiance. The reservoir by the entrance to the village is located on one of the walking trails of Jirisan Mountain. The sight of the village reflected on the reservoir waters makes for a beautiful spring photograph. 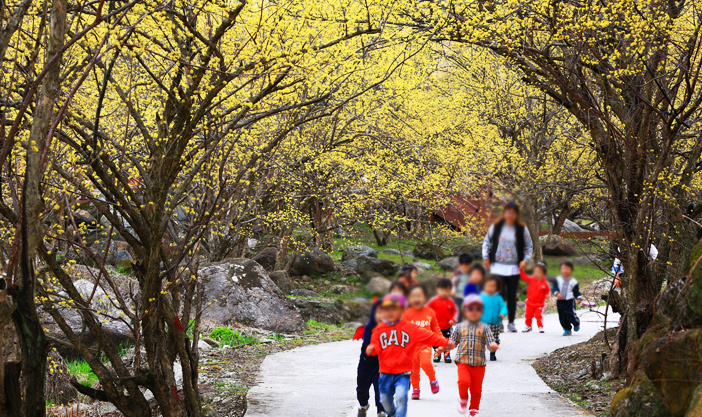 Take a walking experience, "Meet Spring on the Sansuyu Blooming Road"
Gurye Sansuyu Festival offers a variety of fun and exciting events and programs for visitors to participate in. Among these, the signature event is the walking program, "Meeting Spring on the Sansuyu Blooming Road." The experience is divided into two courses, ranging from 1.2km to 1.5km, with registration for course one being 5,000 won and course two being free to all guests. However, registration is accepted in a first-come, first-served basis so it may fill up early. Other open events include taking pictures with a large-scale model of a sansuyu blossom, exploring the festival grounds on a stamp tour, hanging love locks and more. 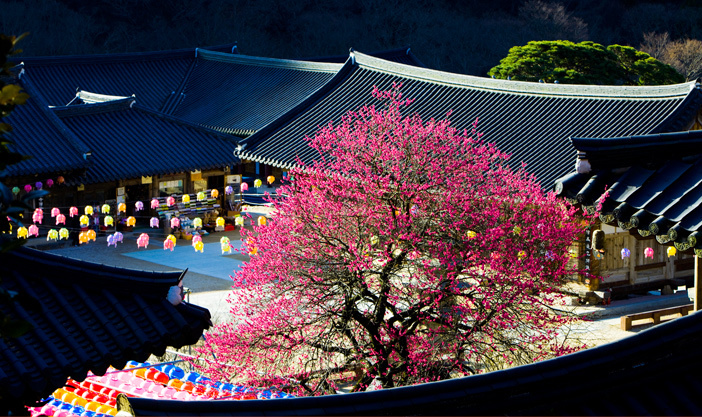 Situated at the foot of Jirisan Mountain, Hwaeomsa Temple has a long and rich history. The trees and valley surrounding the temple create a protected, cozy atmosphere. Hwaeomsa Temple serves as a wonderful local cultural asset, with many natural monuments and Gakhwangjeon Hall, a national treasure. Gurye Traditional Market is a 5-day market, held on dates ending in a 3 or 8. Together with Hwagae Market in Hadong, Gyeongsangnam-do, Gurye Traditional Market has long been a leading open-air traditional market in the southern region where people from Gyeongsangnam-do and Jeollanam-do mingle together as both sellers and buyers. 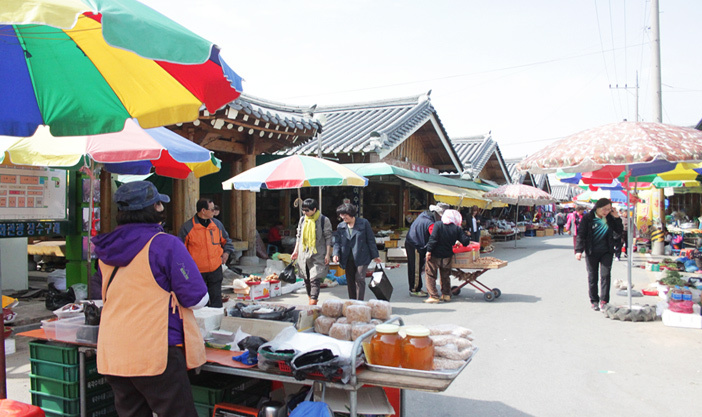 The market in Gurye is visited by a large number of people from the nearby cities of Namwon, Gokseong, Suncheon, and Hadong. This kind of market is hard to find in big cities and visitors are sure to experience a unique traditional market ambiance and generous merchants. Daseulgi (marsh snail) have a bluish flesh inside a light brown shell, and come in a number of varieties. 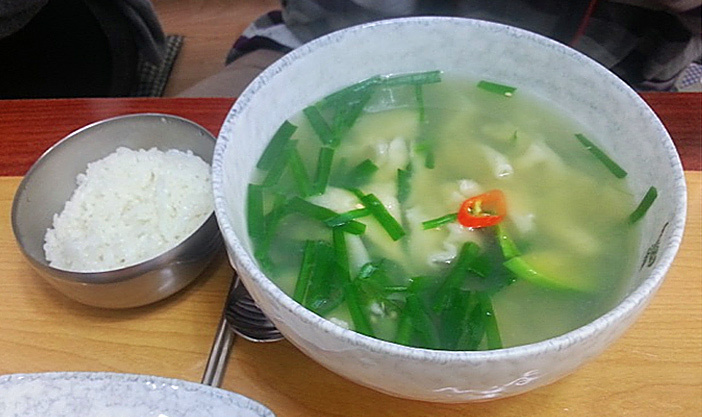 Daseulgi sujebi is a soup with dough flakes and marsh snails caught from the clean waters of Seomjingang River. The marsh snail is used to flavor the broth. In addition to the marsh snails, onion and chives are added to the soup along with chunks of dough that are torn into small pieces by hand. After being boiled over the fire, the soup will turn green, signaling the daseulgi sujebi is ready! 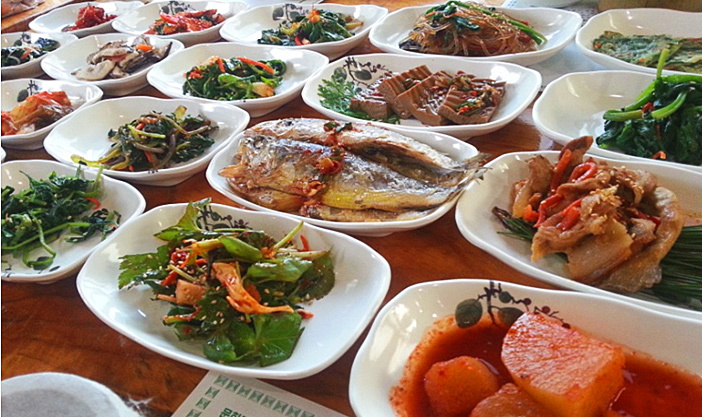 Daseulgi sujebi can easily be found in restaurants around Gurye. 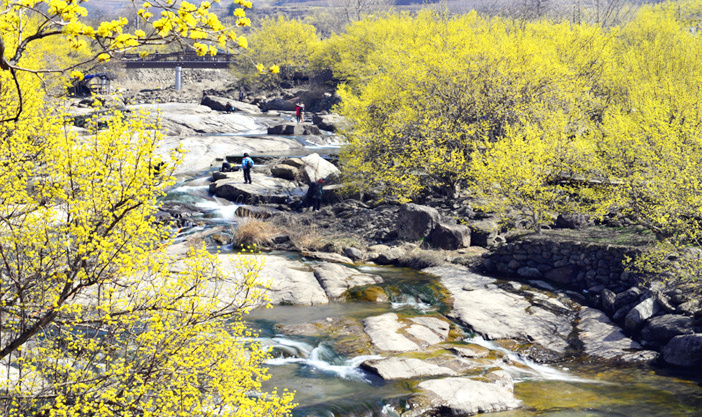 Flanked by Jirisan Mountain and Seomjingang River, Gurye boasts a splendid natural landscape. The mountains are deep and the waters are clear, so the area is rich in clean wild vegetables year round. Some wild greens and vegetables like balloon flowers, bracken, and groundsel found at the foot of Jirisan Mountain are high in both flavor and nutritional value. For this reason, these wild vegetables are highly popular and widely consumed. Gurye Sanchae Jeongsik is a table d'hôte meal featuring seasonal wild vegetables picked from Jirisan Mountain. Enjoy the vegetables with doenjang jjigae (soybean paste stew) served in a ttukbaegi (hot pot) or jeyuk bokkeum (stir-fried pork) for added flavor. * This column was last updated in March 2017, and therefore information may differ from what is presented here. We advise you to check details from the official website before visiting.